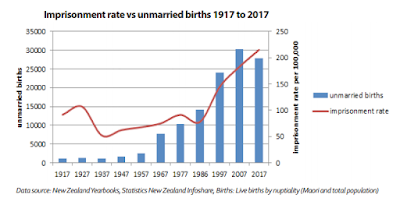 The rest of the paper argues why this is more than mere correlation traversing Maori urbanisation, whanau and nuclear family disintegration, gangs, state-care and inter-generational dysfunction. As a society we continue to keep paying for it - the processes and consequences. 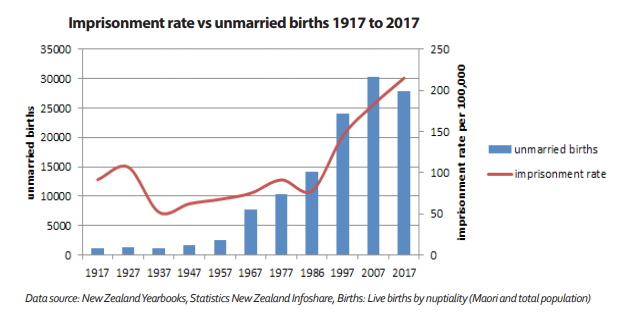 One hand in the Labour Party is actively increasing welfare while the other is planning to hold a hui on how to bring down the prison population. If you think putting more money into dysfunctional families will reduce crime reflect on what children of gangs told the Children's Commissioner. That, despite feeling bound to follow in their footsteps, one of the upsides of living in gang families was not having to live in poverty.